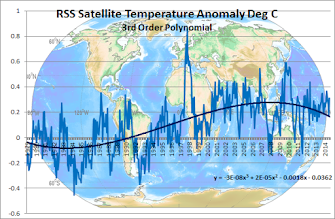 Climate Common Sense: New NASA Paper - It's Better Than We Thought! More signs of cracks in the Warmist edifice when a NASA/NOAA paper is published saying that a doubling of CO2 would only cause a 1.6 Deg C rise in global temperatures due to increased vegetation growth having a negative feedback effect, absorbing CO2. The NASA and NOAA boffins used their more accurate science to model a world where CO2levels have doubled to 780 parts per million (ppm) compared to today's 390-odd. They say that world would actually warm up by just 1.64°C overall, and the vegetation-cooling effect would be stronger over land to boot – thus temperatures on land would would be a further 0.3°C cooler compared to the present sims. The fact that this paper has been published at all shows a sea change in attitude as it previously would never have seen the light of day. I ran that past a warmist and he debunked it saying: "The focus of the study was not to determine global temps but to quantify the negative feedback effects of evapotranspiration. Since the model started with a low warming figure, it resulted in a low warming figure when evapotranspiration was plugged in. 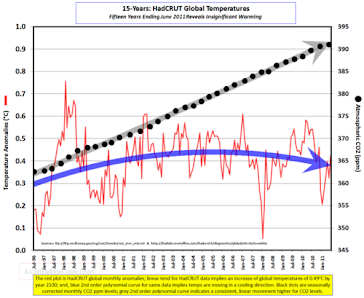 Had the model started with a higher warming figure, it would have resulted in a higher warming figure when evapotranspiration was plugged in. "